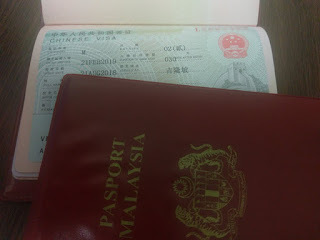 Malaysian passport holder who intends to visit to China needs to apply for a valid visa before making the travel, as there is currently no visa exemption arrangement between China and Malaysia yet. 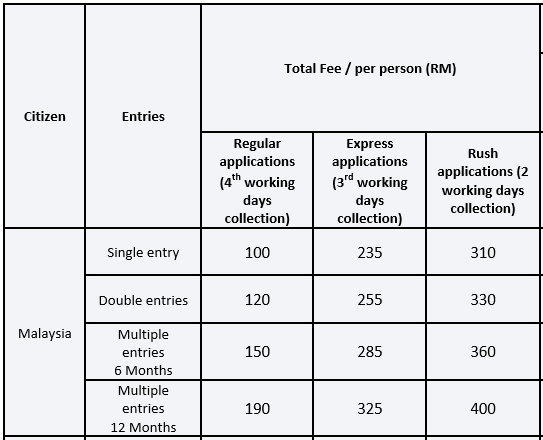 Application for the required Chinese visa needs to be done in the office of Chinese Visa Application Service Center (CVASC) available in Kuala Lumpur, Penang and Kuching. You can either complete the whole process by yourself, or choose to make the visa application through an agent, which will charge you additional fees for their service. In fact, the process to apply for Chinese visa is pretty straightforward and fast provided you follow the procedure correctly. The Kuala Lumpur CVASC office is located in Hampshire Place, Jalan Mayang Sari, 50450 Kuala Lumpur. You can take the LRT there by coming out from either Ampang Park station or KLCC station. The Hampshire Place building is within walking distance behind the Bank of China building. If you drive there, you can park in the visitors car park of Hampshire Place, but the parking lots are quite limited. In case the parking at Hampshire Place is full, you can park your car in the visitors car park of Megan Avenue 1 just across the road. 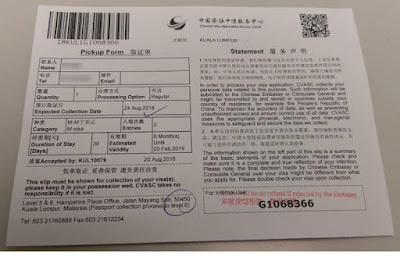 Here is the procedure to apply for the China visiting visa by yourself with Kuala Lumpur CVASC. A valid passport with more than 6 months before expiry date. Your passport must have at least 2 empty pages. The visa itself will take up one full page. A photocopy of your passport page with your personal information and photo, and the adjacent page with your signature. 2 pieces of passport size photos. Make sure the background of the photo is white (not blue) in colour. If you are travelling as tourist, you will need to submit a photocopy of your air ticket. 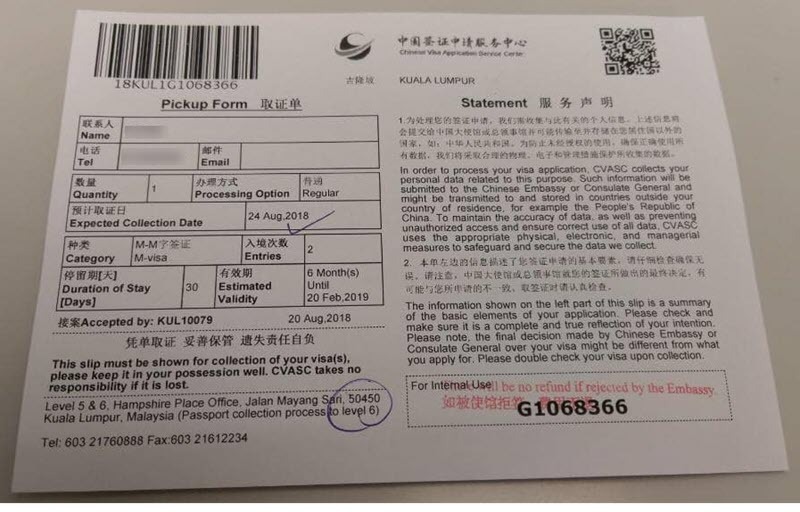 If you are travelling for business trip, you will need to submit a letter of invitation from China and a letter of dispatch from your company in Malaysia. There are certain criteria needs to be explicitly printed in both the letters, including your personal particulars (full name, gender, date of birth, etc. ), detail of the company that issued the letters respectively (name, contact, address, official stamp, etc.) and your visit itinerary. The date of both the letters must not be longer than 3 months from the date of visa application. You can apply for single-entry visa or multiple-entry visa. If you intend to apply for multiple-entry visa, you need to also photocopy your passport page containing your previous Chinese visa which was applied less than 2 years ago. 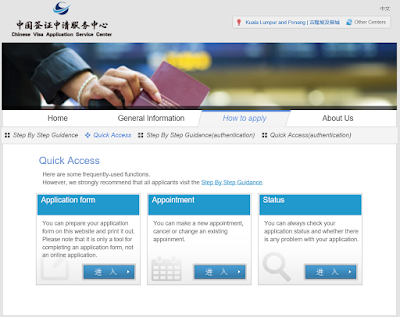 For first time visit to China, you can only apply for single-entry visa or double-entry visa. The computer is installed with Adobe Acrobat Reader. The computer is connected to a printer. Preferably to access the online visa application form and online appointment form using Google Chrome. When you are ready, click here to go to the Kuala Lumpur CVASC Quick Access webpage. You might want to bookmark this URL for future access. Click on the button inside the Application form box in the webpage. Follow the step-by-step instruction to fill up the online visa application form. Save your form online, and go through all the fields to review it. Make sure all information is correctly filled up. Finalize and print out your visa application form. Don't forget to manually sign on the printed application form. Don't forget to attach with your passport size photos (with white background) and all the supporting documents. Click on the button inside the Appointment box in the webpage. Fill up the online appointment form. Submit the appointment form online, and print out the confirmed appointment slip. On the date and time of your appointment, bring your original passport, photos, all supporting documents and the appointment slip to CVASC office at Level 5 of Hampshire Place. At the front counter, submit all your documents for checking. If all your documents are complete, you will be given a queue number. Wait for your number to be called, submit your documents to the officer, and you will be given a pickup form with the date to collect back your passport. The whole process should take less than 30 minutes from the time you step in Level 5 to the time you step out the office. No payment is needed during document submission. You will only need to pay during passport collection. On the day of passport pickup, just bring along your pickup form and visit CVASC office at Level 6. There is no specific appointment time needed for passport collection. You will need to arrive at the office between 9.00am and 3.45pm. Let the front counter inspect your pickup form, and you will be given a queue number. Wait for your number to be called, submit your pickup form to the officer, and you will be required to make payment for your visa. You can either pay by credit card or pay by cash. After payment made, just wait for a while and your passport will be returned to you with the visa in it. Make a last checking on the visa detail before leaving the CVASC office. The whole process should take less than 30 minutes from the time you step in Level 6 to the time you step out the office.